We need new language to talk about war. “Boots on the Ground” Is a Meaningless Phrase. We Need New Language to Talk About War. 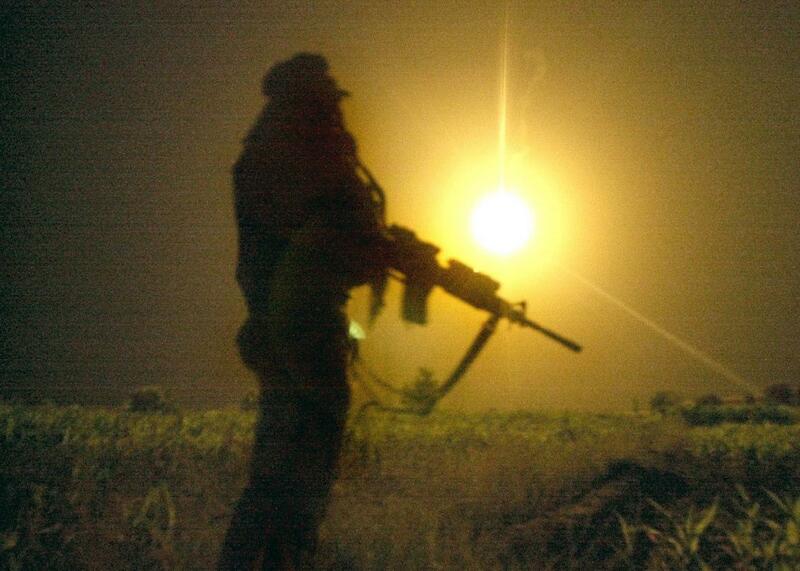 A member of the U.S. Army Special Forces stands guard at the perimeter of a compound suspected of holding al-Qaida and Taliban forces on Aug. 25, 2002. We’re living in “the age of the commando,” wrote former Army Capt., Iraq veteran, and novelist Matt Gallagher in Sunday’s New York Times. Along with drones, the reliance of special operations forces—including Delta Force operators, Navy SEALs, Green Berets, and Army Rangers—has been one of the hallmarks of the Obama administration’s national security policy, though the commandos have gotten a lot less attention than the robots. Gallagher has concerns about this approach. “Special Operations are not a panacea,” he writes. “Just as SWAT teams can’t fulfill their purpose without everyday beat cops on corners, operators can’t and don’t function in a vacuum.” Beyond questions about efficacy, though, this dependence on special forces is also rendering the political debate over the use of U.S. military force increasingly obsolete. Barack Obama came into office promising to end the Bush administration’s unpopular wars in Iraq and Afghanistan, and technically speaking he has—though, as his critics often point out, he’s conducted combat operations in more countries around the world than his predecessor. But even as American troops have returned to Iraq to fight against ISIS, and even as the White House has elected to keep American forces in Afghanistan through the end of Obama’s presidency, the White House has maintained that U.S. troops are not involved in ground combat. It’s kept to this line, even when special operations troops have been killed in combat against ISIS. Meanwhile, in the GOP primary, the candidates have all criticized the president for putting unnecessary limits on the means he would use to fight ISIS. Marco Rubio and Jeb Bush in particular have gone after Obama’s reluctance to put “boots on the ground.” But with the exception of the recently departed Lindsey Graham, no candidate for president is explicitly calling for a deployment of regular ground troops in combat with ISIS anyway. It seems likely that the next president, whichever party he or she comes from, will continue the current reliance on special operations forces, the training and equipping of foreign allies, and airstrikes. “Combat operations,” and “boots on the ground” are no longer particularly useful ideas given the way that America conducts war today. In the “age of the commando,” we need new language to talk about war. *Correction, Feb. 2, 2016: This post originally misspelled the name of Abbottabad, the city in Pakistan.